It's just days away from Thanksgiving, and Allie's totally into the holiday this year. She's put in her order for Thanksgiving Day Dinner... quite literally, as you can see! But then she heard Merrick had Turducken in their Purrfect Bistro line. Since we've never bothered to serve this delectable dish at any of our Thanksgiving dinners prior to today, well...she insisted on taste-testing this as well. Faraday: So Allie, uh...can I try it too? Allie: Honestly, Faraday. Do you think just anycat can select the best foods to offer our guests? This calls for a sophisticated palate. 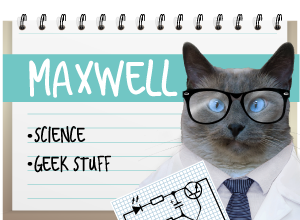 Anycat that still plays "pull my paw" is automatically disqualified. Faraday: *grumbles* But Mommy says it's polite to share. Allie: Tell you what, Brat. I'll share this dish with you. Faraday: Uhm, Allie. 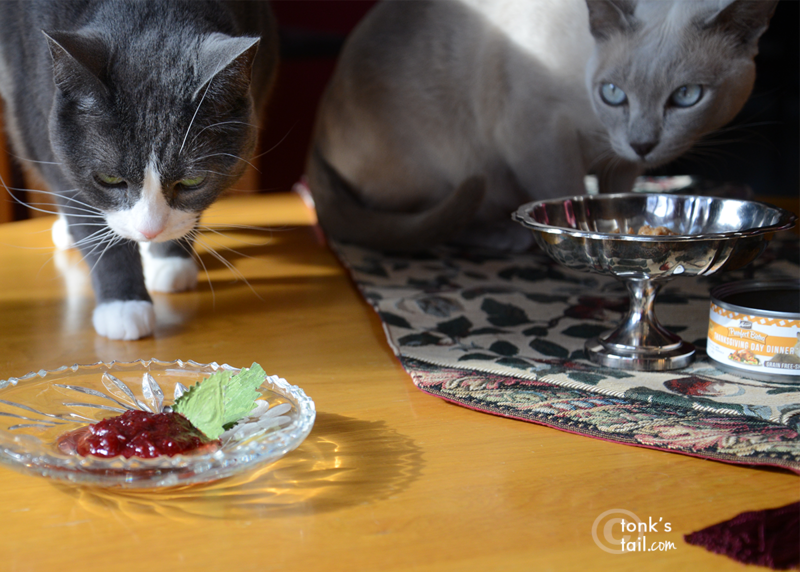 Cats don't eat cranberry sauce. Even if it is homemade. Allie: Well, she garnished it with catnip. Then said something about it "adding color" to the photos, so deal with it. Allie: While Mother's busy hiding the pumpkin pie from a certain Tonkinese Terror, baking her fresh challah and 'from-scratch' stuffing, I'll be digging into some delish entrees from Merrick! Won't you join me? This season we're very thankful that Allie is well on her way to her ideal weight, with her pounds lost in a slow and safe manner while eating a food she loves. We three kitties are also very thankful to have a warm and loving home, and we wish the same for the many homeless pets across the world who are not so fortunate this holiday. May they soon enjoy warmth and safety all their own. Isn't it fun having festive flavors for the holidays, Allie? I had never seen that video of Faraday and the pumpkin pie...hysterical!!! That food looks yummy. 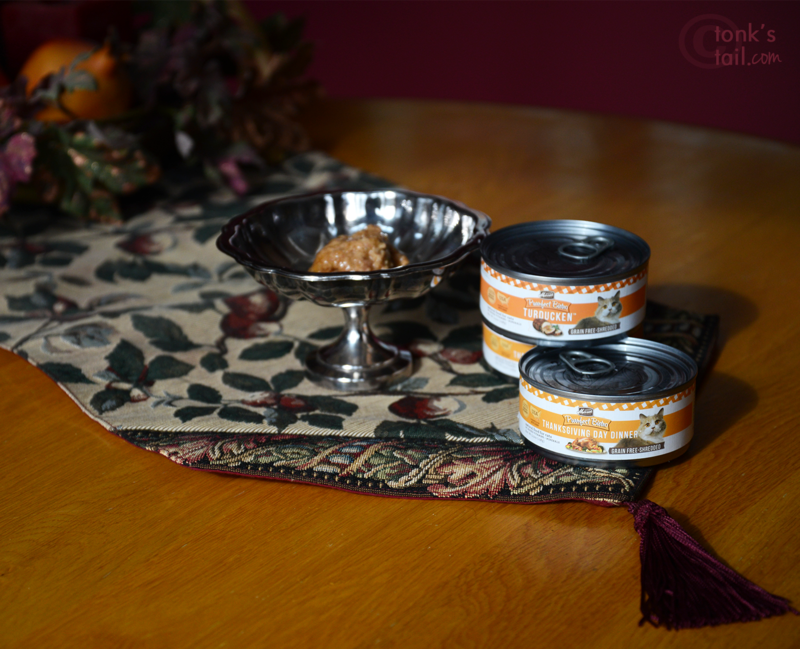 We have tried the dog version of Merricks turkey dinner and it is delish! Allie: Isn't it just to DIE for yummy???? Sushi loves the dog version of Thanksgiving Dinner, it is one of his favs! We're laughing at Faraday's video...we never saw that one either! Faraday: Seriouslies. Is it a crime to like pumpkin?!?!? I ask you! 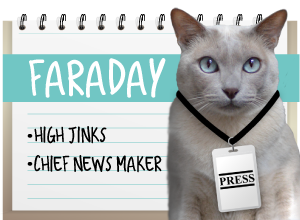 OMC, we never saw the video of Faraday and the pie. That's too funny! We are all for the whipped cream, but we have never actually managed to taste the pie to find out whether it's good, but Faraday answered that question! Faraday: Mommy came home last night with an APPLE pie. EWWWWWWWW. We love your Thanksgiving photo shoot! How wonderful! Allie we are so glad you are enjoying your scrumptious meals. Allie: ooh THANK you! I directed it myself! Yum! The other kitties have had Merrick's Turducken, but I haven't yet! Maybe I will get my human to pick some up next time we're out shopping for cat food! Doesn't it sound just DELISH??? That looks like a great meal for a kitty's Thanksgiving! 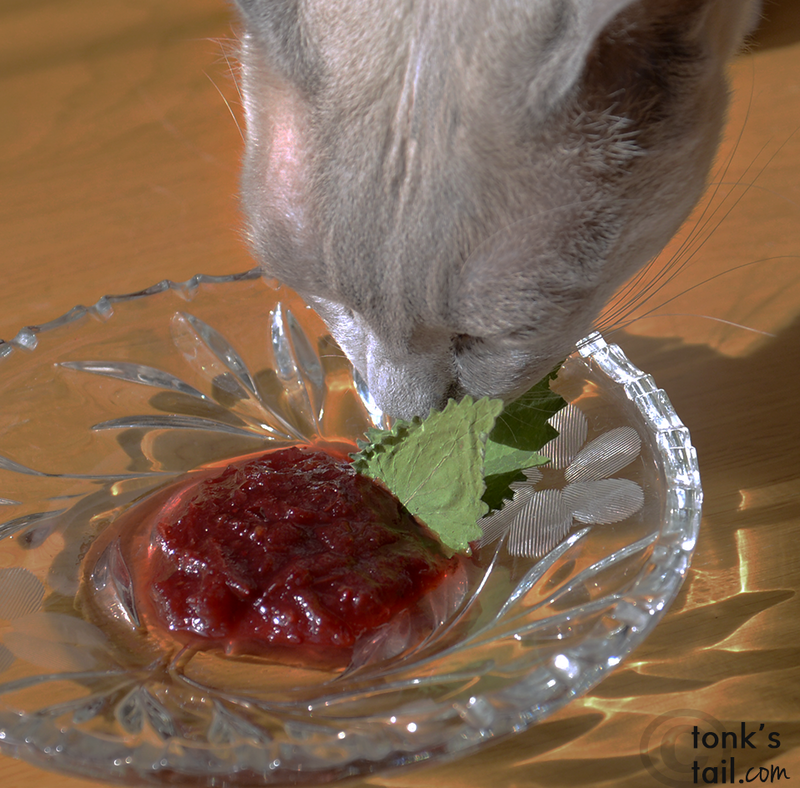 Mmm...I'd love to try that cranberry sauce, and of course with catnip! Mother says that if you really wanted the cranberry sauce recipe, you could take a quick peek at her other blog that just soft-launched: www.herbandlegends.com - it's there! 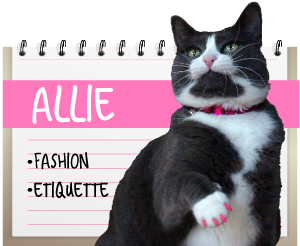 Allie, you are totally looking ever so svelte! OMG! Allie! yous looks marvelous Darling! You look wonderful Allie. TW bought that Thanksgiving Dinner by Merrick one year for Christmas. I think I ate it but I haven’t seen it since. Their Gramma’s Pot Pie was a fail. OK, THATS the best cat food bowl we ever saw! Lots of healthy yummies at your house. MySquatty the Stray likes the Merrick canned food but Raven is too finicky to try it. Maybe she's waiting for fresh catnip garnish. Did you like the turducken? We just love that stuff. We put a pic of ours on the blog last Sunday. Mommy is doling it out slowly, so we can enjoy. Have a great day, furriends! Well, we would be very thankful to get an invite to your Thanksgiving table to join you in some of that yummy looking Turducken! Well, thanks for this post. My cats saw it and now they are demanding Mom go and buy them their own turkey dinner since my sisters and I have the dog turkey dinner in a can. You cats! Presentation is everything. All girlcats know THAT. OMC that video of Faraday is great! Allie that is quite a nice table you set :) Hope you all enjoyed some of that Turducken!